Oh Pam! You seriously have to make these. You can use your own gluten free peanut butter recipe if necessary, but this combo is so amazing I can’t even explain it! LOL! I just stocked up on gluten free AP flour so this is on my list! I cannot wait to hear what you think! I seriously think they are my new fave. I have to stay away from them! LOL! They sound soooooo good. And I have been meaning to make pb cookies. This is perfect! Delightful ! I’ll have to get my brother to bake some of these! You do! You really do! Won’t you be my neighbor????? Those peanut butter cookies look so tempting and delicious, Jodi. Oh Peter! You and Gertrude must try!! YUMM!! These look and sound delicious!! OH PJ! You would love them! thanks! they are really delish! I wish there were words to describe how yummy these are! LOL! I think I’d still have to add a little chocolate on top of the marshmallow… Kind of like a s-more! 😉 Yum! You know what Jenna? I am totally not a marshmallow fan either. But have you tried Marshmallow Fluff? O M G! 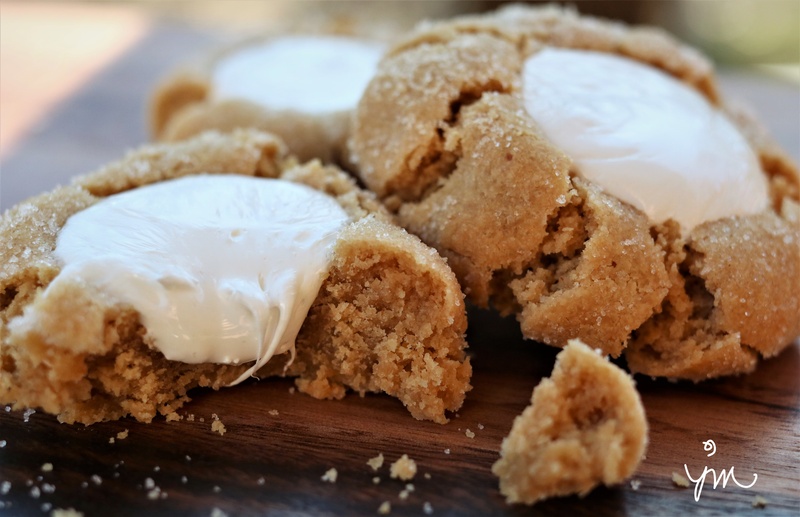 In a puddle in the middle of a peanut butter cookie – it is the most glorious taste ever!! 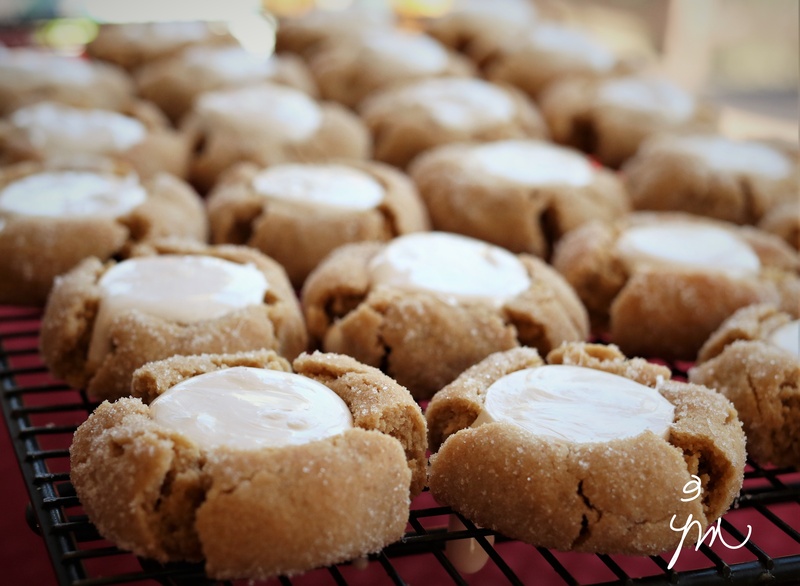 Without them, it would just be a peanut butter cookie…..
ok, you’ve sold me! I will try!! In the interest of providing Benjamin with an activity to promote strengthening of his fine motor skills and to fulfill my insatiable need for anything peanut butter…this will be at the top of Monday’s list of priorities! While I am not a fan of Marshmallow Fluff, eldest daughter is and a jar is a pantry staple. I am presently waiting for my favorite Peter Pan Simply Ground Honey Roast Peanut Butter to arrive, but will use the jar of Jif that is eldest daughter’s favorite brand. This first time will be with regular flour, the next time with gluten free. I’m a firm believer in the theory that cookies can make everything better. As the character of Ana Pascal says in the decade plus old movie “Stranger Than Fiction” : “I just figured if I was going to make the world a better place, I’d do it with cookies.” Thank-you x 2!! Good Grief! I forgot to fill in the details before hitting post comment. I never had to do this until about a month ago and frequently forget! I LOVE THAT SAYING!!! How did I never hear that yet? thanks for sharing! You and Benjamin are going to LOVE them! I just know it! ENJOY!!!! 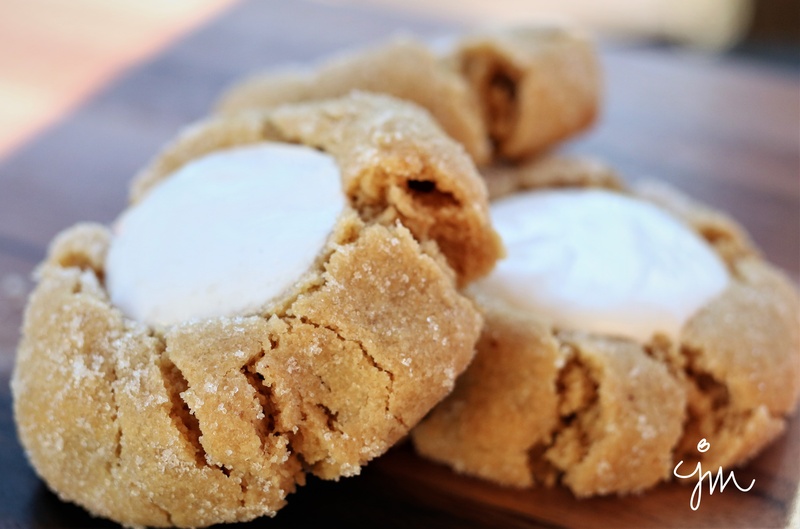 I love how you used Marshmallow Fluff for these cookies. Unique! Kerfe – these are so hard to pass up…. LOL! These are so beautiful! Wow. OH Jodi!! Its fluffer nutter cookies!! I have to make them! I grew up on peanut butter and marshmallow fluff sandwiches. 🙂 Have to share these with my sisters. 🙂 Thanks for the recipe! What a great idea! Personally, I don’t care for peanut butter, but I’m thinking that adding the marshmallow fluff to a chocolate cookie would taste terrific. Or, in keeping with my goal to lose five pounds, I could make the peanut butter version and let the rest of my family eat them…..LOL! You don’t care for peanut butter? I just don’t know what to say…. LOL! Might just be amazing with a chocolate crinkle though!!! I just had to return to tell you about our cookie making adventure this morning. When I had mentioned that this would be at the top of Monday’s priority list, it hadn’t occurred to me that today is April Fool’s Day. As soon as Benjamin arrived this morning, I asked if he would like to help bake the cookies that I saw on your blog. “Are they April’s Fool cookies?” he asked. I explained that this is the first day in the month of April and it’s called April Fool’s Day. “Gem, I know cause you play funny jokes and make everybody laugh.” We decided to share our cookies with some neighbors and friends. We made two batches of the cookies and he is quite the cookie making king. It got a bit messy, but so much fun. When the first pan came out of the oven, I started making the indentations. Benjamin did not want them “broken, cause that’s not funny”, and I explained that we were putting the marshmallow fluff into the dents like in the picture. I started putting the softened fluff into the cookies and he said : “I don’t want goop in my cookies.” I told him that it is just like marshmallows, to which he responded : “Gem, I like the skin on my marshmallows!” I laughed and then so did he, but he remained adamant about “no goop”! I always have a bag of mini marshmallows for him and I decided to try putting two into each cookie while still a bit warm. That met with Benjamin’s approval. We made some with goop, some with minis and some just plain. While they were cooling off, I got some little white handled bags ready to place them in for delivery. Benjamin started laughing and said : “Gem, we can be the bestest fools ever if run fast!” I was a bit perplexed until he said : “We put the bag down, ring the doorbell and run. That’s a good joke right?” So, on each bag I wrote…From the April Fools. We put the bags on the doorsteps, rang the bell, scurried away as quick as we could and only got caught one time! I think this may have been the best April Fool’s Day ever! Oh yes, they are yumalicious all 3 ways! Thank-you x 2!! Fluff is a “food” that I’ve introduced to my husband’s California born-and-raised family and they find it endlessly hilarious and fascinating. Can’t wait to make these for them, now!